257 in stock Need More ? Sarah J. Maas's New York Times bestselling Throne of Glass series reaches new heights in this sweeping fourth instalment. Everyone Celaena Sardothien loves has been taken from her. Bloodthirsty for revenge on the two men responsible for destroying her life, and desperate to find out if the prince and his captain are safe, Celaena returns to Rifthold. She has accepted her identity as Aelin Galathynius, the lost Queen of Terrasen. But before she can reclaim her throne, there are dark truths to learn and debts to be paid. 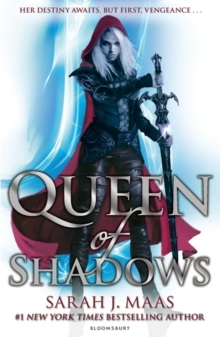 Aelin must stay hidden beneath her assassin's hood and draw on her mortal strength as Celaena to prevent the King of Adarlan from tearing her world apart. Only then can she fight for her people. Readers will be held rapt as Celaena's story builds to an agonising crescendo, packed with heart-pounding action and swoon-worthy romance.